A well dressed table is like a well put together outfit. It makes the kitchen feel complete and invites conversation. Y’all know how I feel about Table Talk and Family Ties, and no holiday would suffice without a properly outfitted place to dine. Don’t get me wrong. I’ve seen some really over-the-top centerpieces, and just like Ina Garten says, “When people start talking about tablescapes, that makes me crazy.” My style is mindful of the budget and inspired by nature, with a few items from around the house. In this post, I’ll provide you with a few tips for creating a sophisticated and simple ambiance this holiday season, using my kitchen table as an example. My table is square, so I used a long table runner right down the center of it. I gathered a few jars of varying heights from my cabinets, like jam and Mason jars, then staggered votive candles on either side of them down the length of the runner. Instead of purchasing flowers, which can be costly and require upkeep, I opted to trim a few stems from my holly berry plant in the yard. I divided the berries and some greenery among the jars. 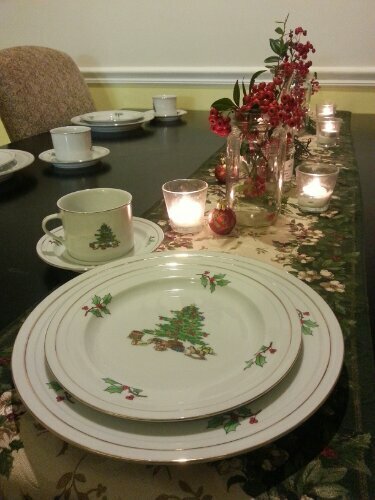 The berries cost me nothing, and they coordinate with my Christmas china and the table runner perfectly! 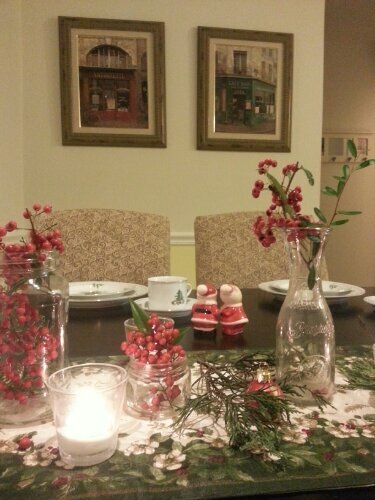 I layered some of my tree trimmings in between the candles and jars, then tucked in little red and gold ornaments to give the table that extra special touch. Pine cones or acorns would also be fun to include. 1) Always use unscented candles. You don’t want artificial scents competing with the food. 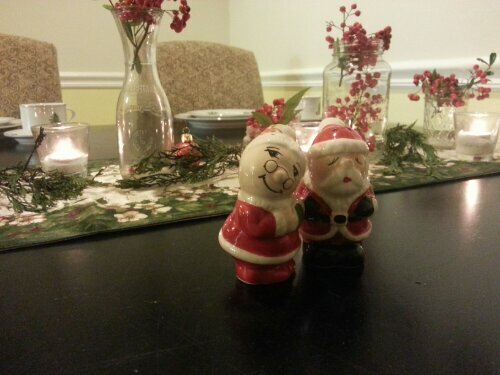 2) Centerpieces should be conversation friendly. 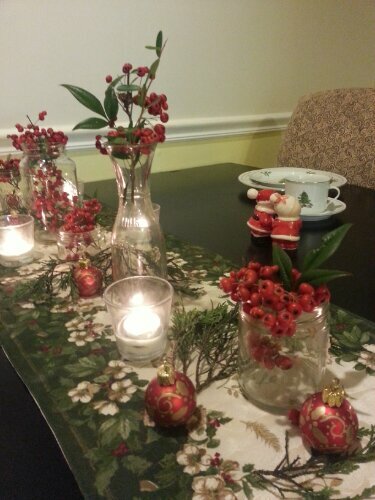 Use either low centerpieces like my jars or tall, slender and clear vases that don’t obstruct conversation. There’s nothing like sitting down to a meal and not being able to see the person across from you. Awkward. 3) Leave your guests with room to breathe. 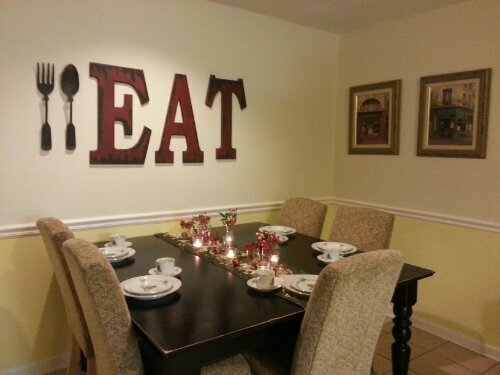 If you’re dining family style, be sure to leave room for casserole and side dishes, and the main course. An overcrowded table feels cramped and stressful. The only thing that will make this table better is good food and good company. After all, that’s what it’s all about! 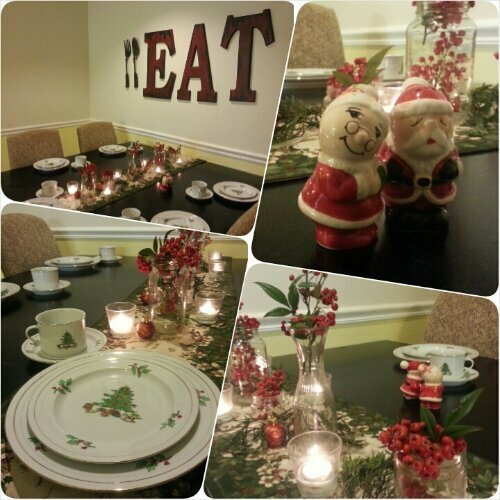 How is your table decorated? What tips would you add to my list? 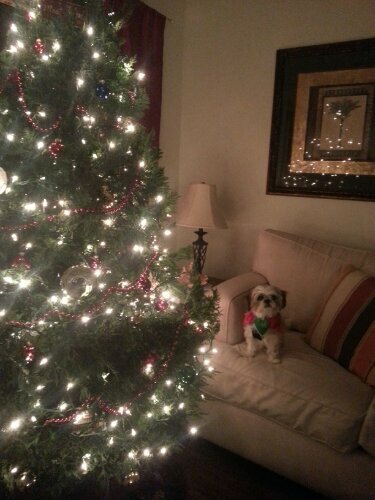 Happy entertaining and Merry Christmas y’all, from me and Ewok.